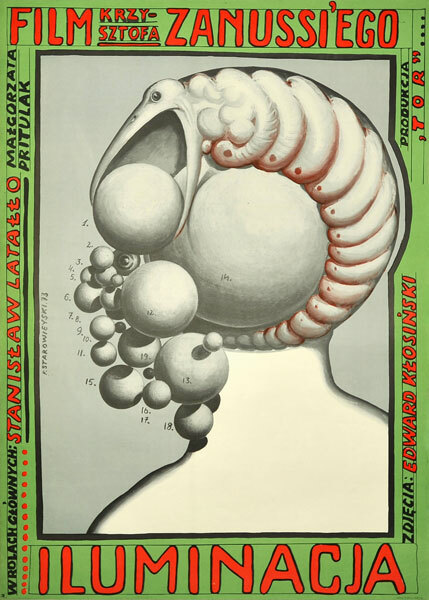 How does the Polish school of poster art deal with Polish films? – The answer to this question can be found in the exhibition. The eminent artists like Jan Młodożeniec, Jakub Erol, Andrzej Pągowski or Witold Dybowski became famous for designing illustrations for the international productions but they didn’t abandon their native film industry! These works are less intuitive, more conscious – in contrast to the posters created for films from GDR, the USA or the Asian countries, Polish cinematography was known to them. Posters then easily harmonize with film convention and its director's style. Several times it will function as an illustration for the film but it can also be an amateur, autonomic comment by a poster artist or an attempt of debate with the film-maker vision as well. The situation is particularly complicated in cases of as few films based of the same novels – what can additionally expand the area of mutual influences. How attentive and good was Jakub Erol as a reader of ‘Nad Niemnem’ by Eliza Orzeszkowa or to what extent has he derived the inspiration from the film based on the same novel directed by Zbigniew Kuźmiński? How much influence from Witkacy's works of art and how much inspiration from the film ‘W starym dworku, czyli niepodległość trójkątów’ directed by Andrzej Kotowski will we find in the poster made by Witold Dybowski? These are only the small fraction of questions which any visitor may wonder about during the exhibition.